It is smart to make way for the ships, if not you may risk a hard impact. PS many times a shoal of fish may be coming after the boat. 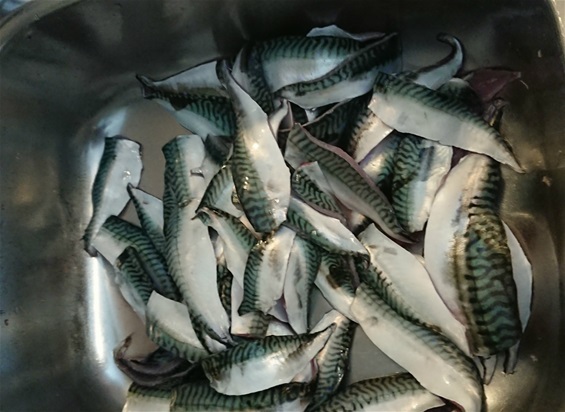 Fishing has been very good this year with Mackerels, Cod, Pollock and Coalfish. Today I went out for some mackerels for dinner. Made some nice filets that is going in the frying pan. Remember to use floating device or Life Vest. I use a safety knife from Victorinox or Wenger on the belt and a MT with me always. 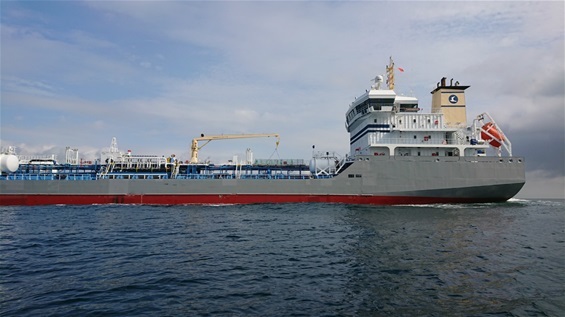 Also have in mind that a large ship like the one on the picture cannot stop without a long distance. Take a 360 degree observation from time to time to look for boats. Use the hearing sense as well. 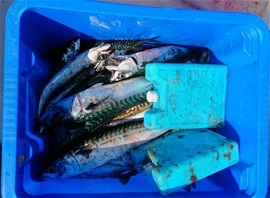 Today it was enough mackerels to fill a boat but it is no point of taking too many. Mackerels like plain black hooks with for example 6 hooks and a sinker. It also likes plain metal hooks with colored feathers. Many different colors can be used. It also bites on rubber worms and on hooks with the spoon shape. It hunts in shoals or in single. It goes at different depths from the bottom up to the surface. It is very fast and bites willingly on many types of lures too. It will also bite on a fly. You can sit on a place waiting for the shoal to arrive or gather. Or you can use different locations and change places looking for them. One method that is effective is hanging the line after the boat and as soon as you notice a bite you stop the boat and perhaps you are just above a large shoal. Getting 6 on a time is very fun in deed. The mackerel tastes wonderful and small ones taste a bite different than the medium. The large ones can also be different. All are very good for the frying pan or hot smoking. Boiled mackerels usually require the larger ones. It is also excellent to cut in small long pieces to be used as bait for Cod, Pollock and other fish. Mackerels are one of the best health foods you can get with a lot of energy for the body. It is smart to during warm weather to have a box with some cooling elements to keep it cool because it is best as fresh as possible. 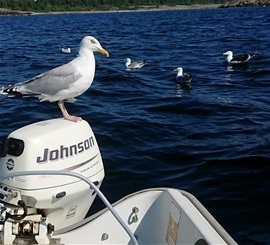 The seagulls and sea birds know the boat and sit and wait when i clean the fish. Heads and internals goes down like hot butter. It is smart to kill the Fish when in the boat. I like to use a sea fishing rod with a reel and on the line i place 6 hooks. I use a sinker or a large jig at the bottom. From time to time when I got the line after the boat from the rod I do some pulling and let go a bit to see if some fish are just following the line without biting. Just at the moment the line stops in the water the fish may bite. This summer I was lying still and got mackerels on my hooks very close to the surface. When I looked into the water I could see the biting on every hook on my line and the rest came fully close to the surface in a large shoal. In a fraction of a second the shoal changed direction all at the same time. It is mind boggling how they can change direction at the same time? It is one of the wonders of the sea that is a puzzle. "Thank you for all your struggles on the sea from the moment of birth to the time you are on my hooks so I can eat. If each fish could tell a story it would be the greatest movie of all time. You must have seen wonders and creatures of all kinds. You struggled against dangers all the time during your life. It is humbling to know"
It is smart to bring oars out with you if you are in bad weather and the engine stops. One person can without any problem row a 14 foot boat. 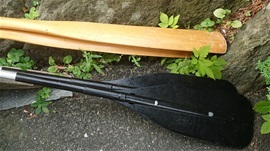 It is also possible for one person to use a paddle for a canoe. It is very effective with two people using one paddle each. In my experience the safest engine is an outboard one that can do good speed. It is much easier to handle a small boat in bad weather if you got some power. It is also quick and easy to get away from other boats that are on collision danger. If you are out in the dark you need light for the boat or at least take with you a head lamp. That is very effective. Once again i would like to mention that always take a knife with you on the water no matter what you are going to do. A MultiTool is a wonderful invention that should be permanent with people on the water or sea. Swiss Army Knives from Wenger or Victorinox are very useful tools. Swiza Swiss knives are excellent too. I would not feel human without knives for safety. It should never happen that people are dragged to the bottom by a rope or equipment without the possibility to cut free. You never know it could happen you come across an accident with people asking for a knife and if you do not have it what then? This summer i have only used my kayak a few times. Some it’s been anyway. Even so it is important to remember safety every time. Use a Life Vest or a floating device. Have a safety knife with you always. A MT can be very smart to bring as well. 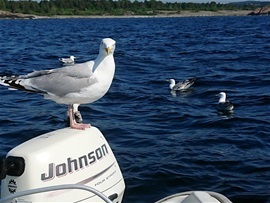 In a kayak or sit on top kayak it is the same situation vs other boats that you have attention around you. It is better to have some distance if you can and that you always have enough strength to put up some speed if suddenly a faster boat could collide. Therefor I recommend that you train to be able to be fast when necessary. It can be difficult to scream because sounds can carry strange or be overheard. It is possible to signal with the paddle and arms. If a boat is doing good speed with the bow up in the air it is very difficult for them to see you anyhow. Therefor it is smart to put up speed instead if you can. This i practise from time to time to have this possibility. The advantage with a kayak is that you can paddle closer to land and on shallow waters. Take the time to look around you before you cross open water between islands and so on. Strong colors are helpful in the outdoors. Coated blades cannot be used to signal with but they are better against corrosion. Good stainless steel with PVD coating will be smart around salty environments. If you do regular maintenance then traditional SAKs and pocket knives will be very well to bring. Remember that in salty environments all tools must have some form of maintenance as a general rule. I fish much less for Cod to help to preserve them and the continuation of the fish. It is less local Cod and so on. Some come in from outside the rim of the coast. A good fillet knife can be helpful for the best possible way to prepare pieces of fish that is going to be fried. On the picture you see a very good Victorinox Swibo knife with the former Wenger still stamped on the handle. For such work you need a safe handle like this got with a long slim flexible blade design. -One knife for each purpose? The answer to this is no. You can do most things with a traditional fixed blade knife. It is just best if you want fillets to have such a knife on the picture. To kill and open the belly of the fish it is best with a traditional Scandi type knife that is easy to clean both knife and sheath. You can do most things with SAKs, MTs and Swiss knives as well. They are not so easy to keep clean for such use. They are excellent for safety and for maintenance. It is possible to use a Fillet knife on the water if you find a quiet place. Older picture.This summer was very warm and very dry with almost no rain for 3 months causing the forest to be extremely dry and several fires happened. According to experts it is not because of environmental change. I believe it is. Next summer may be the coldest in 100 years, I do not know. I believe the strange shift up and down weather during the last years comes like pearls on a string and not only from time to time. If it is a man made change or the Earth adjusting itself i do not know. This year we have had the warmest summer for a very long time. There are a few different year dates on this already. It is most likely the warmest in 100 years or so. This means the temperature in the water may reach higher levels in temperature than normal. This is also so in the fresh water lakes. Some dangerous bacteria can occur because of this and people should take some precautions. It is a rare problem here, even so open wounds or cuts can make such bacteria dangerous. So called flesh eating bacteria and is no joke if a person should be unfortunate. It is also smart to have some attention to weather and thunder storms coming in your direction. A sea twister could also start to form and these are not good for small boats and kayaks. 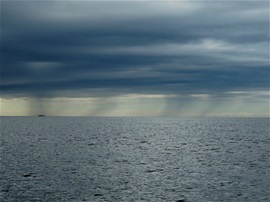 Sometimes it is just rain in the distance you see. I have also experienced very powerful and strange currents during the last years.